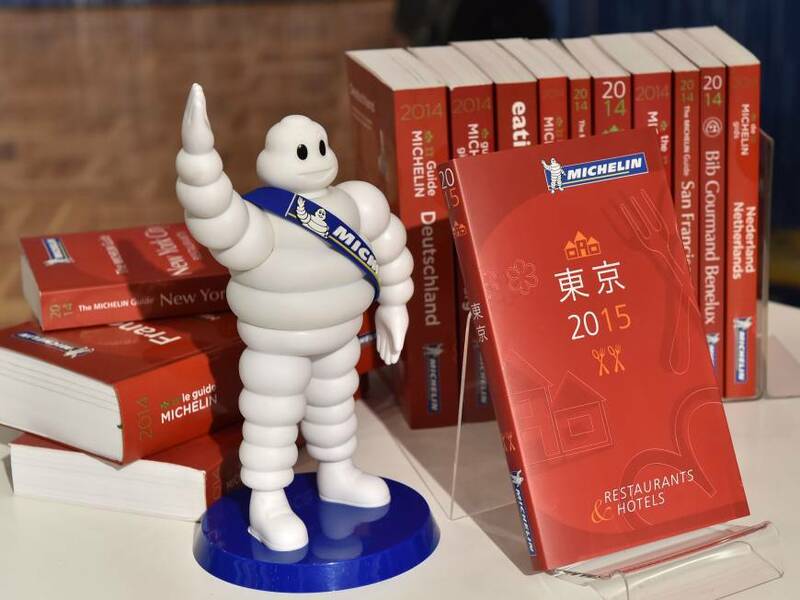 Just this week the 2015 Michelin Guide came out and The Japan Times reports that Tokyo has retained its spot as the best city in the world in which to eat. But back in September, Marc and I celebrated our 20th wedding anniversary, and in lieu of presents, we decided to go experiential, and we made reservations at a restaurant called Kanda. 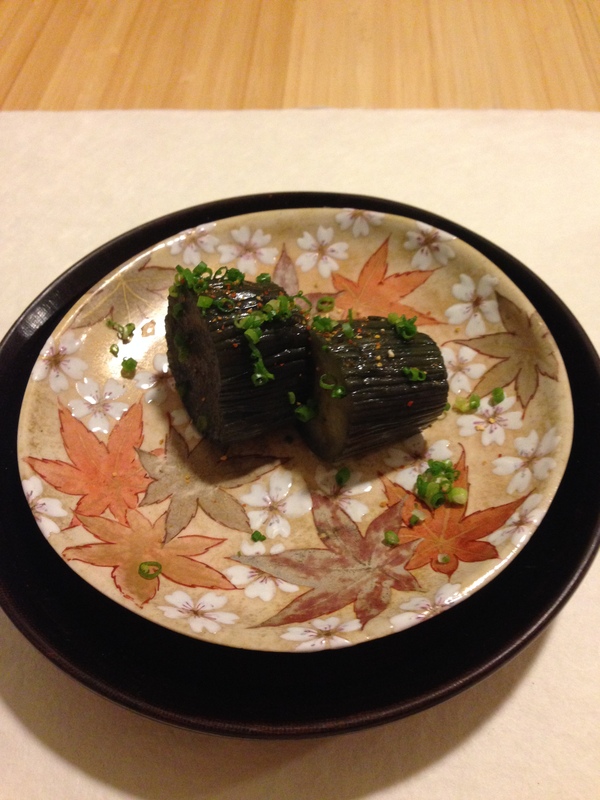 In the new guide, Kanda is listed as #4 on the list of the twelve best restaurants in Tokyo. It deserves the rank; it was a food experience like no other I’ve had. 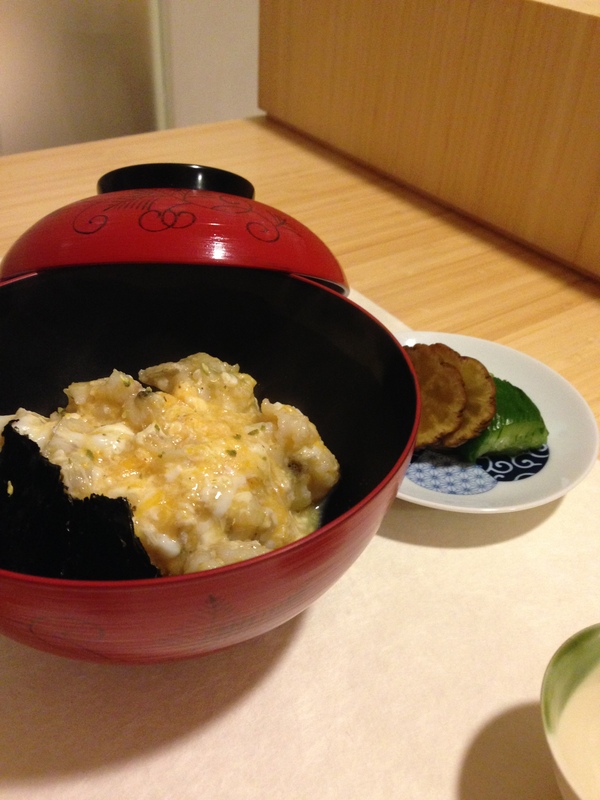 Kanda is located in Moto Azabu just off TV Asahi Dori, near the fire station, if you know Tokyo. It is on the bottom floor of an apartment building and the sign is out of the way and very unobtrusive. It is only in Japanese. If you were not looking for it, you’d never find it. I did not take photos of the sign, the door or the restaurant in general because they only allow pictures of the actual food. The restaurant is small and spare, but elegantly decorated. There is one table in a side room behind a curtain that seats about eight, but the main dining room consists of twelve seats at a bar. It is done in light wood with bamboo-backed chairs. The walls have a few small paintings and Japanese sayings in Kanji adorning them, but otherwise the focus really is meant to be on the food, not the place itself. 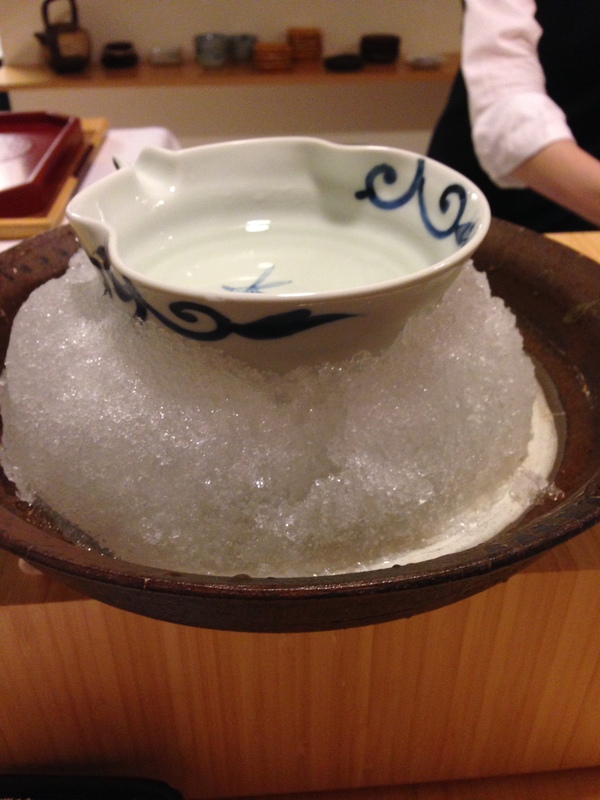 This is how they serve the sake – on a bed of ice to keep it chilled for us. But what food it is! We had a total of eleven courses. 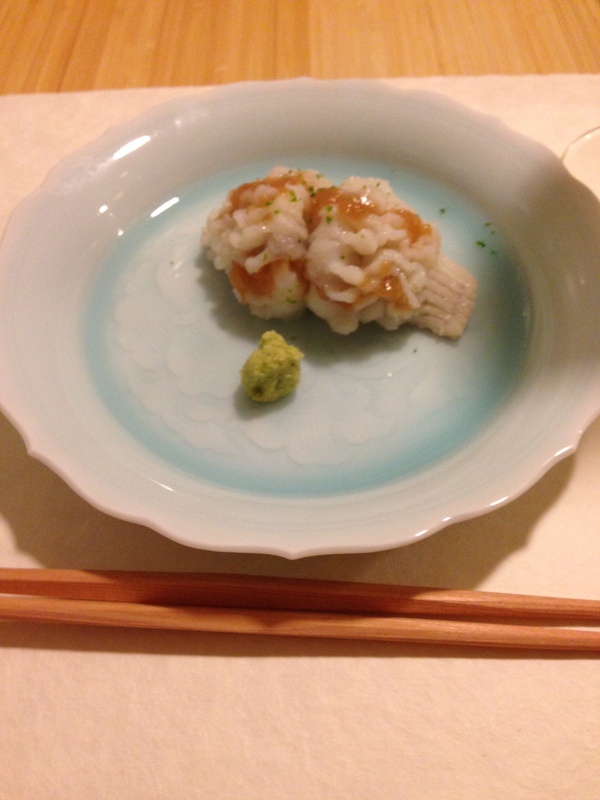 Remember, each course in Japan is small, a few bites at most. As is common, we chose the middle course menu and we picked it ahead of time when we made the reservation. The only menu we ever saw was for drinks, and even that was small in number. 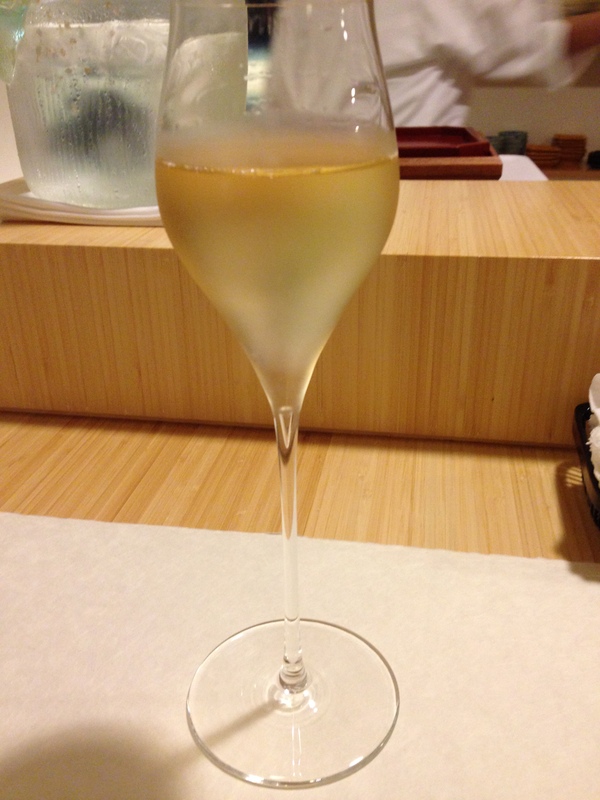 Since we were truly celebrating, we started with a glass of champagne, but that and a small bowl of sake were our only drinks. 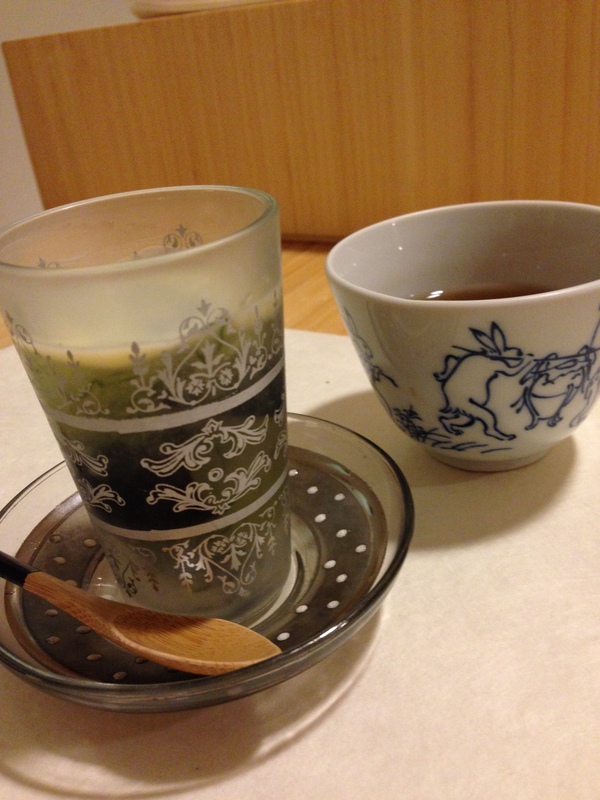 We felt it was too important to focus on the taste of the food and did not want alcohol to dull our senses. Hamo – lightly cooked. In English it’s conger pike. Otoro – fatty tuna – the very best part of the fish. 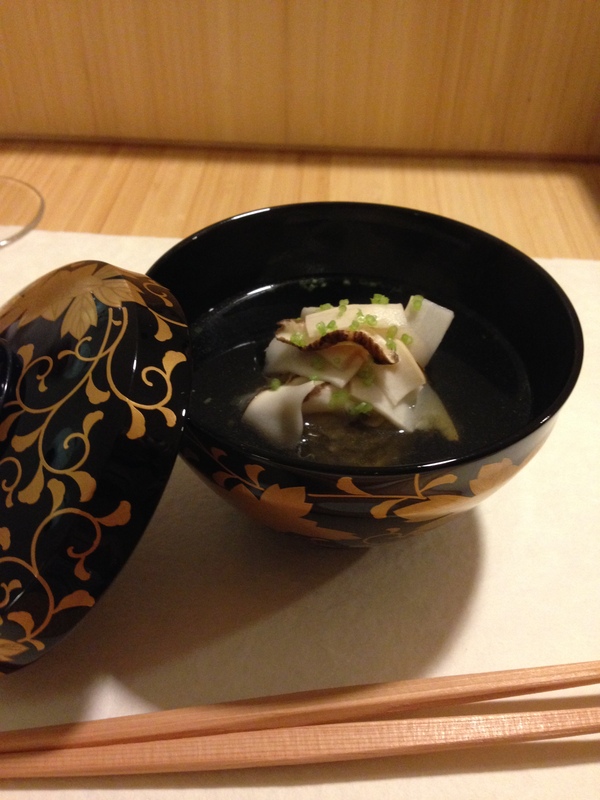 Soup with a dumpling made of yuba – skin of the bean curd – with decadent matsutake mushrooms, available only in September and October. 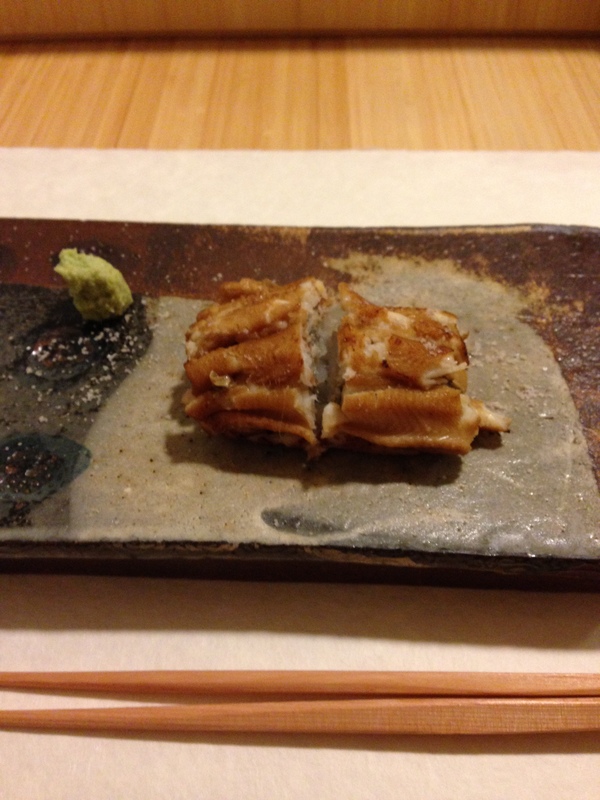 Anago – eel, perfectly grilled. 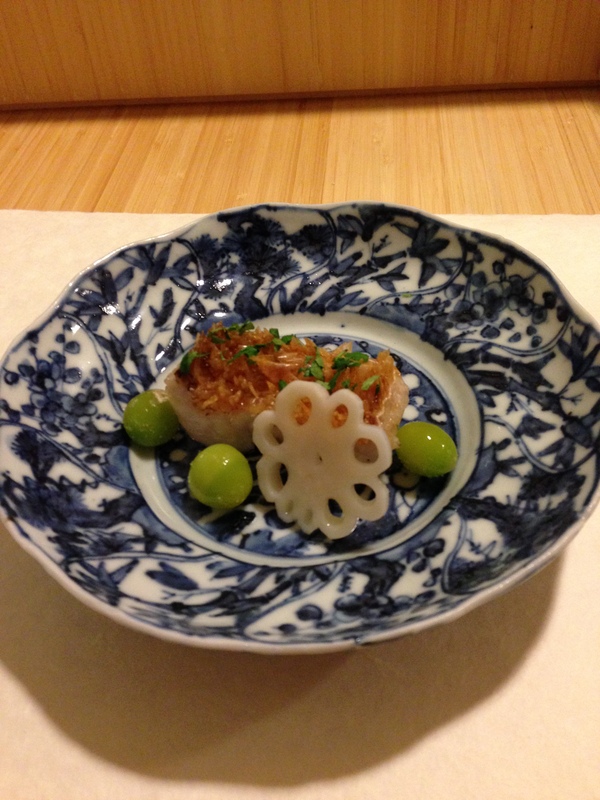 Suzuki fish grilled, but then only the top is gently fried for a mix of textures that melt in your mouth. 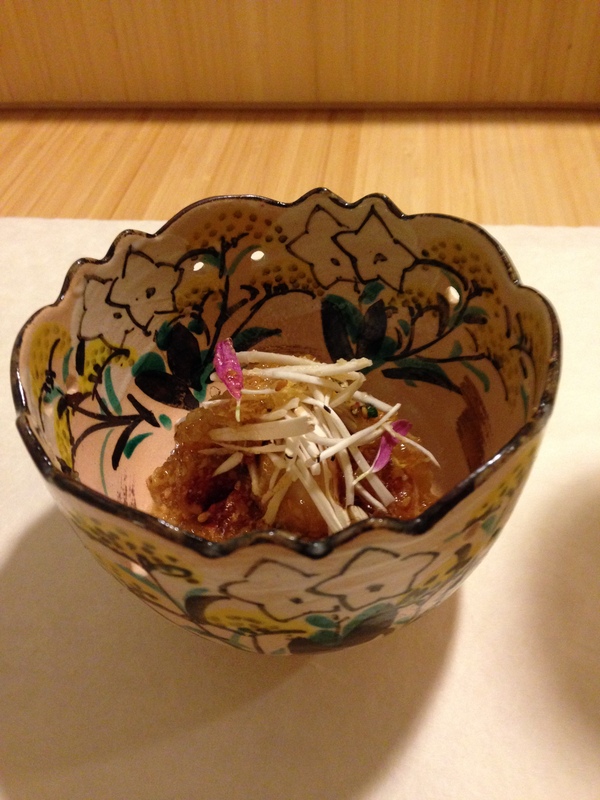 Surrounded by ginko beans and rinkon – lotus root. 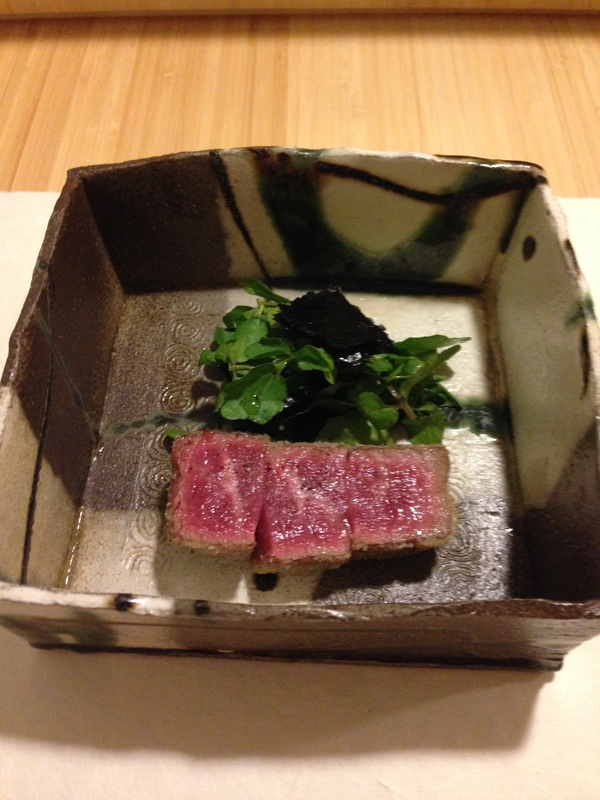 The most precious, delicious and succulent piece of Japanese beef we have every had or may ever have again. A sweet taste of pistachio pudding – it tasted like we were eating the nuts, just softened. 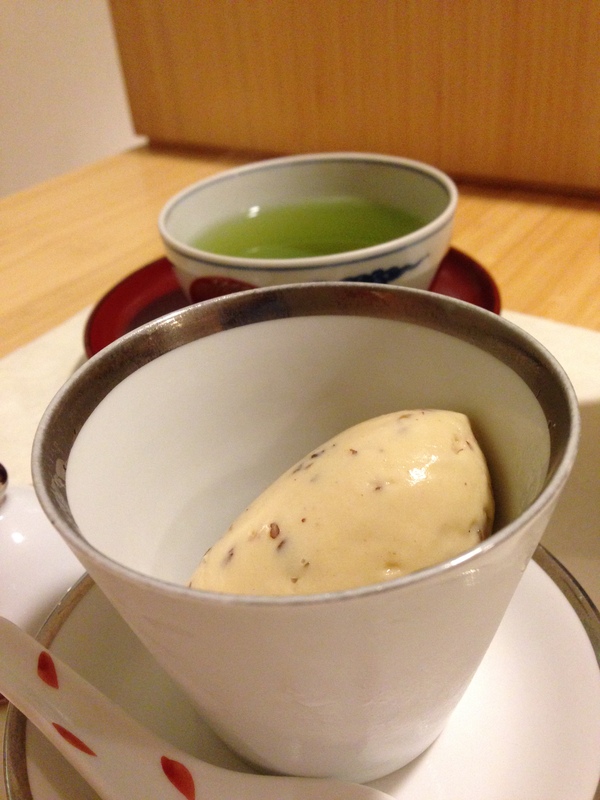 One last tiny taste of sweet – chestnut ice cream – which was the perfect ending to the meal. 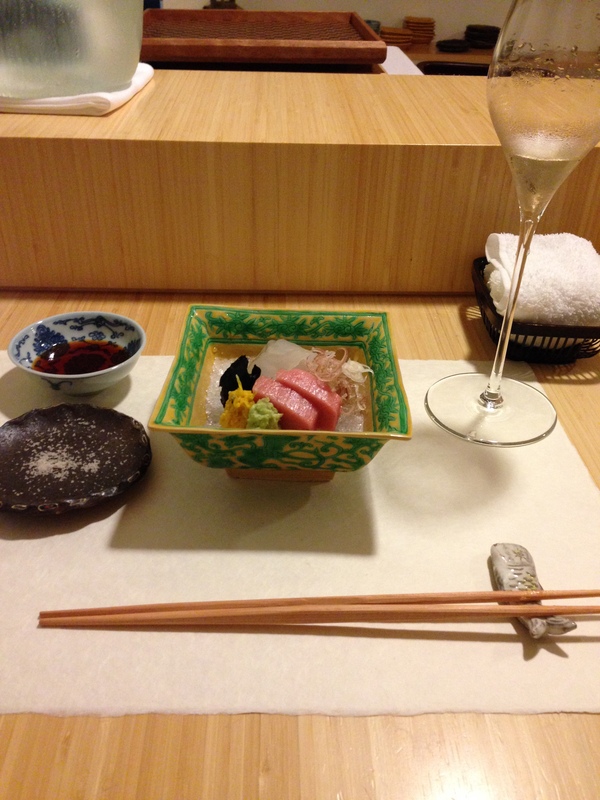 This was truly the meal of a lifetime – so far at least! It was pricey for sure, but worth every yen for the experience of it.